Sweet Street Desserts | Favorite Foods, Inc. In 1979, in Reading, Pennsylvania, Sandy Solmon started baking classic American cookies in a 2-bay garage. Tirelessly testing recipes and ingredients, she struck the perfect balance: a harmonization of flavor, texture, and the elusive dimension of artfulness, the je ne sais quoi, that separates good cookies from great ones. As her cookies caught on and the following for her small production grew, Sandy’s dessert portfolio expanded and Sweet Street Desserts was born. Today, Sweet Street is the leading innovator in the dessert industry. We’re still owned and operated by Sandy and headquartered in Reading where Sandy is also the head of research and development, leading a team of like-minded, passionate researchers and recipe developers who now bake for restaurants in over 60 countries, on every continent. Amazed by the power of good food shared, Sandy’s collaborative experiences inspired her to open Cafe Sweet Street in Reading, PA. A locavore concept, Cafe Sweet Street features made-from-scratch lunches from pure, locally sourced ingredients. Her latest project, The Sweet Street Mobile Art Kitchen, is a food truck serving up American cuisine throughout the streets of Paris featuring delectable baked goods, indulgent mac-and-cheese and handmade beverages. 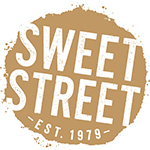 Though Sweet Street’s reach is global, our passion for artful food and dedication to quality and innovation remains the motivation behind every one of our products. We challenge ourselves to source authentic ingredients, from hand-selected South American chocolates to locally harvested crisp apples, as part of our rigorous, collaborative explorations to improve our existing recipes and actualize our ever-evolving ideas and inspirations. We then gather around the tasting table and taste for the same qualities that made our customers fall in love with our first batch of cookies. The sweetness of dessert is beloved by every culture on this planet of ours. In this spirit, all of us at Sweet Street invite you to a culinary experience destined to be shared with cherished family and friends. The Power of Good Food Shared™ inspires all of us at Sweet Street to innovate and create the finest, indulgent foods served globally. We nurture the idea that our offerings are universally enjoyed by families and friends, making us part of life’s celebrations and memories. We at Sweet Street choose to be the industry leader, setting the standard by which all others are judged. Exceptional food is our way of life. Our passion for pure, sustainable ingredients and unwavering commitment to always exceed the expectations of our customers ensures our future. Innovation, efficiency and flexibility in all areas are essential to our profitability, the engine for our continued success. But Sweet Street is about more than great food. Above all, we are dedicated to creating a safe, dynamic and gratifying environment so compelling, our customers, suppliers and co-workers want to participate in achieving mutual success. By continuing to conduct ourselves with the utmost integrity and by anticipating the best interest of these valued people, our company’s sweet success is certain.